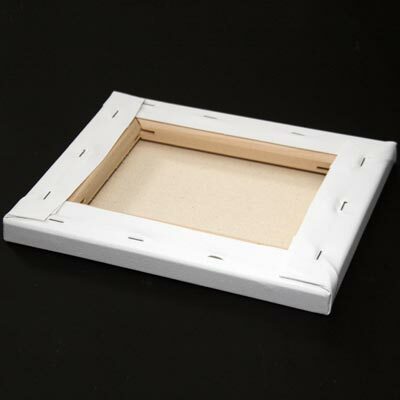 Our Stretched Canvases are made in Canada and stretched on Canadian kiln dried knot free basswood. We use a heavy duty #12 cotton duck canvas for all of our canvasses. The canvas is double primed with a white acid free acrylic gesso making the weight about 16oz/sq. yd. after priming. Most commercially made stretched canvas is made with 7 or 8 oz. unprimed canvas, which is considerably lighter weight then what we offer Bracing on larger sized canvases provide additional stability, prevent warping, and are recessed to keep the canvas off the bars. All canvases are stapled on the back and are suitable for oil and acrylic painting. Custom sizes are made to order. See our custom ordering page for an order/inquiry form. The max custom size is 60″ X 84″. FREE SHIPPING ON ORDERS OVER $99.00, EXCEPT FOR OVERSIZED CANVASES. A 20 inch by 30 inch standard stretched canvas. Depth is 3/4 inch by 1 5/8. A 18 inch by 36 inch standard stretched canvas. Depth is 3/4 inch by 1 5/8.